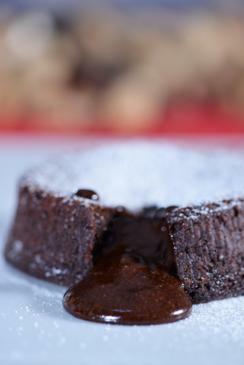 Molten chocolate lava cake is a great showpiece with which to end the meal. These delicious individually sized desserts have a cakey exterior with a gooey center of molten chocolate that oozes out when you cut them. While the cakes seem complex and showy, they are actually surprisingly easy to make. They also lend themselves well to an array of flavorings and toppings that allow you to vary the taste. This recipe makes six individual cakes. Preheat your oven to 400 degrees Fahrenheit. Butter the muffin tin or ramekins and dust them with sugar, tapping out any excess. In the stand mixer fitted with paddle attachment (or in a mixing bowl using the hand mixer), cream the butter and sugar on medium speed until it is fluffy, five to six minutes. With the mixer still running, add the eggs one at a time, beating for two minutes after each addition. Turn the mixer to low speed and add the flour and salt, mixing until it is just combined. Add the chocolate and beat on low speed until it is just combined. Pour the mixture into the prepared muffin tins or ramekins. If using ramekins, put them on a baking sheet. Put the cakes into the preheated oven and bake for eight to ten minutes, just until the tops of the cakes no longer wobble when shaken gently. Cool the cakes on a wire rack for ten minutes before serving. Then, unmold the cakes by gently tapping them against a plate. If the cake sticks, tap the bottom of the mold with a wooden spoon. Use all bittersweet chocolate or all semi-sweet chocolate instead of half and half. Replace both chocolates with an equal amount of white chocolate. Replace the vanilla extract with an equal amount of rum extract, orange extract, maple extract, almond extract, or peppermint extract. Add the zest of half an orange to the batter. Top with simple whipped cream. For the holidays, top with crushed candy canes. Warm jam or fruit preserves in a saucepan and use as a warm topping. Top with warm caramel sauce. These beautiful and versatile cakes make the perfect dessert to serve guests. With their warm gooey centers and a tasty topping, molten lava cakes are the perfect ending to a meal.